One of the more interesting challenges all repairshops meet is that first service job on a new assembly. The experience can be either frustrating or rewarding, depending on whether the shop is prepared with the answers to the key question — how do you fix it? The answers to retractable hardtop service problems, both mechanical and electrical, are easy to apply. For instance, the most common fault, reports one repairshop handling a volume of this body service, is a hardtop that will retract only part way. It was found in almost all cases that the cause was an inadequate power supply, due to a partly discharged battery. This points up the basic step in locating an operating trouble — first check the battery to be sure the power required is available to do the job. To check the electrical control circuit for the cause of an operating trouble, remove the two cap screws that retain the rear seat back and lift it out. Then remove the cover from the metal box that houses the 10 power relays. Each of these is identified by the diagram on the housing cover. To test any of the 10 basic circuits, energize the applicable power relay with a jumper wire connected from a hot, or common, terminal to the relay-actuating terminal. This by-passes the various limit switches and operates the motor directly. A motor stalled against a jammed lock screw or running free because of a broken flexible driveshaft can be heard. If the motor operates normally when the control circuit is bypassed, make a continuity test of the other parts in the control circuit to isolate the trouble. A defective relay is uncovered by connecting the jumper from hot terminal to feed terminal of relay. If a motor does not operate when its control circuit is bypassed and no mechanical failure is evident, check for a defective power relay. 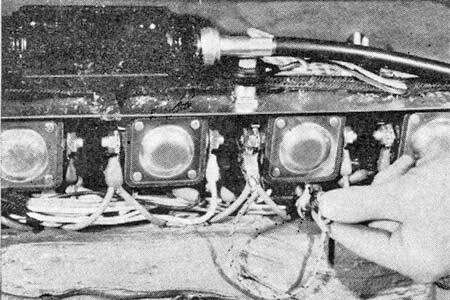 To do this, connect a jumper wire from the relay's hot terminal to the motor feed terminal of the relay. If this actuates the motor, the relay is defective. If it does not, the motor is faulty or there is an open circuit in the motor feed. The open circuit could occur in a defective circuit breaker in the motor ground lead. If a motor continues to run after its portion of the cycle has been completed and after the actuating switch has been released, the power relay is defective. To stop the motor and to replace a relay, disconnect the battery. The roof can be operated manually when electrical or mechanical controls do not work. Thus, if the deck lid fails to open when the control circuit is by-passed with a jumper lead, the lid can be raised manually to get to the defective part. To unlock the deck lid manually, place a jack under the rear frame crossmember and raise the car approximately 9 in. Remove the screw that retains the deck lid lock from the underside of each wheel housing. Then lift the front edge of the deck lid about 1 in. so that the actuating switch can be operated to complete the opening of the lid. To raise the deck lid when the motor fails to operate it, first unlock the lid with the actuating switch or manually as described above. 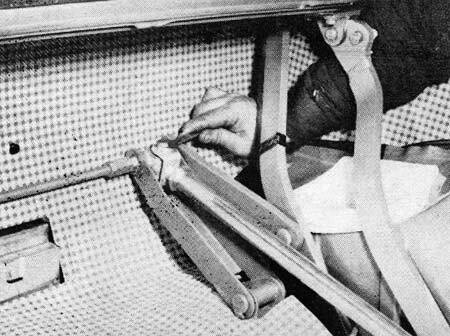 Then, with a helper holding the lid down, remove both screws that retain each lift jack from underneath the lower back panel. Raise the lid just far enough to permit removal of the clevis pins from the top of the lift jacks. This will avoid damage to the flexible drive shafts. The opening can then be completed manually. The roof can be raised manually when there is a failure in a motor, flexible driveshaft, lift jack or linkÂ¬age. To do this, open the deck lid, lift the forward edge of the roof about 5 in. and block it in this position. Then remote the bolts that connect the lift jack to the arm and move the roof into place to permit roof lock engagment. Removing bolt that connects the roof lift-jack to the lift arm allows the roof to be moved manually. To release the front roof locks manually for removal when they fail to unlock with the top erected, remove the windshield upper garnish moldings. Take out the two retaining screws on each lock through the access hole in the header to release the locks. Remove the inside center molding at the front of the roof to disconnect the wires to the roof lock motor. Then manually lift the roof at the header and operate the actuation switch to continue the retract cycle. To release the rear roof locks, remove the inner rear molding and retainer from the roof side. Take out the two lock retaining screws with a box wrench through the clearance provided between the body quarter panel and the roof panel. With the locks thus released front the roof, disconnect the wires from the motor and manually lift the rear of the roof at both sides. Then operate the actuation switch to continue the retract cycle. 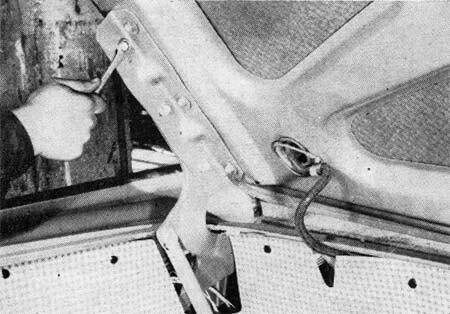 Deck lid adjustment to the trunk opening is made with the roof erected and the package tray folded. The lid can be adjusted fore and aft, or up and down, by loosening the screws on the two counter-balanced hinges. Adjust rear deck lid by loosening the cap screws that secure bracket to the deck lid and its hinge. Roof alignment is obtained by means of fore-and-aft and up-and-down adjustments made at the right and left power-link adjustment screws. In addition, the height at the roof front only can be changed by turning the right and left control link adjustments. Turning screw at power-link pivot bracket in trunk well adjusts roof fore and aft, up and down. To align the roof to the windshield header and rear quarter, and to obtain proper timing of lock engagement, loosen all roof-lock assembly mounting screws just enough to retain lock washer contact with the mounting surface. Push in on the actuating switch until all the roof locks stop. This should securely lock the roof. If the roof does not align and lock down, operate the actuating switch to move the roof to the point of lock engagement. 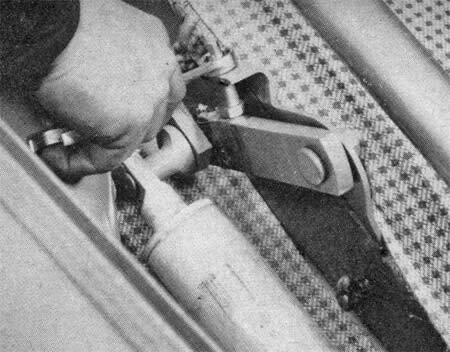 Disconnect the two flexible driveshafts at the roof motor to elimate drive tension on the roof linkage. Remove the bolts from the base of the roof lift jacks, then loosen the lock nuts and back off on both control link adjustment screws. Loosen the four adjustment nuts on each power-link pivot bracket, but be sure to retain lock-washer tension. Control-link adjustment to the rear of power-link pivot bracket changes roof's height at front only. Now lock the roof by using a jumper wire at the roof-lock power relay, adjusting the roof manually, if necessary, to align the locks. With the roof aligned and locked, unlock it at the unlock power relay, then relock it at the lock power relay. With the roof locked down, adjust both rear power links by turning the fore-and-aft adjustment screws so that the slack is just removed, then tighen an additional half turn. Tighten the retaining nuts on each power link pivot bracket. Turn the control link adjusting screws to contact the control link, then tighten the screws just two additional turns and tighten the lock nuts. Loosen the lock nuts on the roof lift jack, slide the notched washers up and out of the notch in the shafts, then turn the jack shafts as required to align the jack bottom bolts. 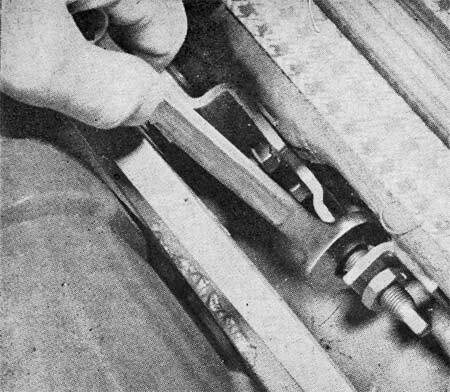 If necessary, turn the flexible driveshafts to obtain alignment. Install the bolts, position the notched washers and tighten the lock nuts. Partially unlock the roof and tighten the front roof lock nuts and the upper and lower rear locks. Then raise the roof and tighten the upper lock components. Tighten the pivot mounting screw first, then the movable screw. In checking engagement, the front locks should engage the lock nut slightly before the rear locks engage. The pitch of the roof can be adjusted, if necessary, at the control-link adjusting screws. This adjustment should be made with the front of the roof supported on a block at the header to take the weight off the linkage. One turn on the adjusting screw gives 3/16 in. movement at the header. To make a major rear roof lock adjustment, loosen the two bolts retaining the lock screw bracket in the roof panel and adjust the screw and bracket fore or aft as required. Loosen the two bolts retaining the lock nut assembly to the quarter panel and adjust the assembly sidewise into alignment with the lock screw. Loosen the set screw and adjust the lock screw in or out of its mounting bracket as needed. If a major front roof-lock adjustment is required, loosen the screws retaining the lock screw and transmission assembly, and pivot the assembly fore or aft at the inboard bolt. Loosen the lock nut assembly at the header and adjust it sidewise into alignment with the lock screw. Loosen the set screw and turn the lock nut in or out of its housing with a suitable tool or one available specially for this purpose. Do not attempt a trial locking of the roof unless the set screws are properly tightened. When replacing front roof lock nuts install the right lock nut with the set screw to the right of the nut, and the left lock nut with the set screw to the left.